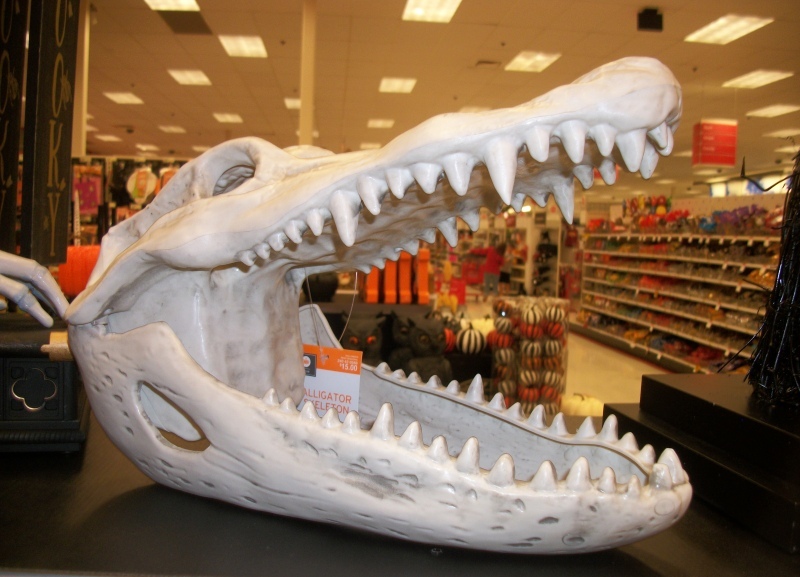 As with Wal Mart, I almost wasn't sure Target would offer much material worth sharing after its skeletal fish offerings, but I honestly should have known better. Target has never let me down. 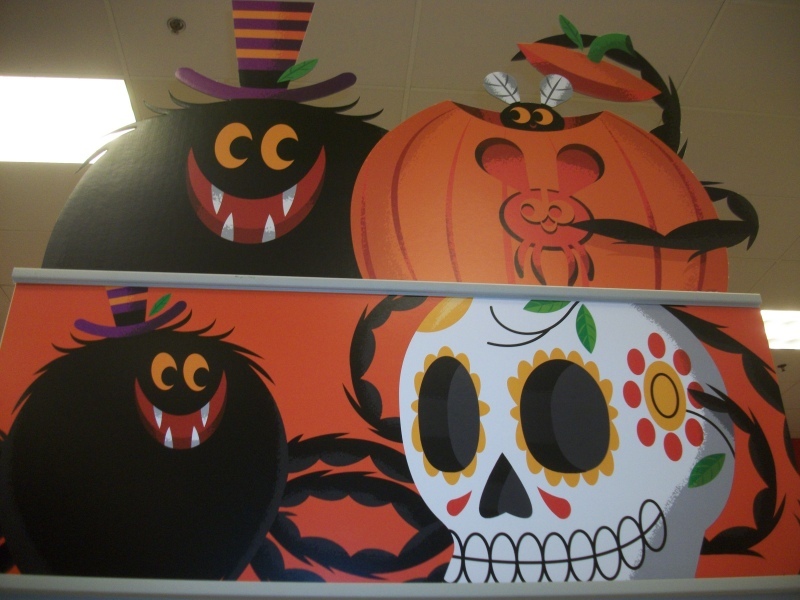 Interestingly, 2015 marks the first Halloween I can remember in which Target re-used its seasonal mascots from a previous year. Normally, I look forward to the brand new set they wheel out season after season, but seeing as 2014's mascots were an unbelievably precious spider and fly, I'm perfectly satisfied that they opted to cut corners this time. I wouldn't mind if these two came back to Target every fall, though it's a shame they still aren't gracing any of the actual merchandise. They're begging for plush toys! When you first enter a Target, you're greeted by a special bargain section, offering items from the one to five dollar range. 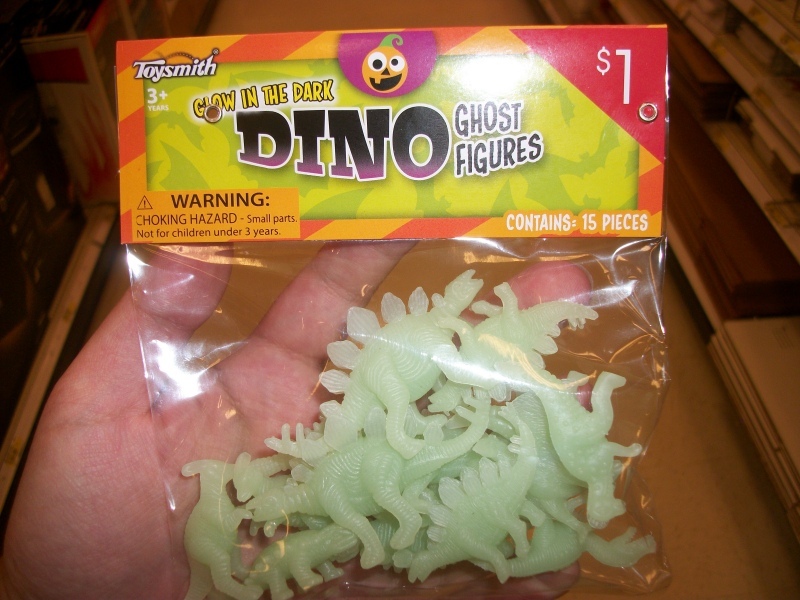 Not many are anything to write home about, but it's really freaking cute how these same old generic dinosaurs have been repackaged as glow-in-the-dark "ghosts." Why the hell don't we hear about dinosaur ghosts way more often? I'm doubly suprised there aren't already a million "dinosaur zombie apocalypse" narratives out there, at the very least. How about vampire dinosaurs? Or maybe fossilized dinosaur liches? They pretend to be regular petrified skeletons during the day, but at night, they're busy bringing other museum specimens to life to guard their phylactery! I think I just re-wrote and vastly improved Night at the Museum. 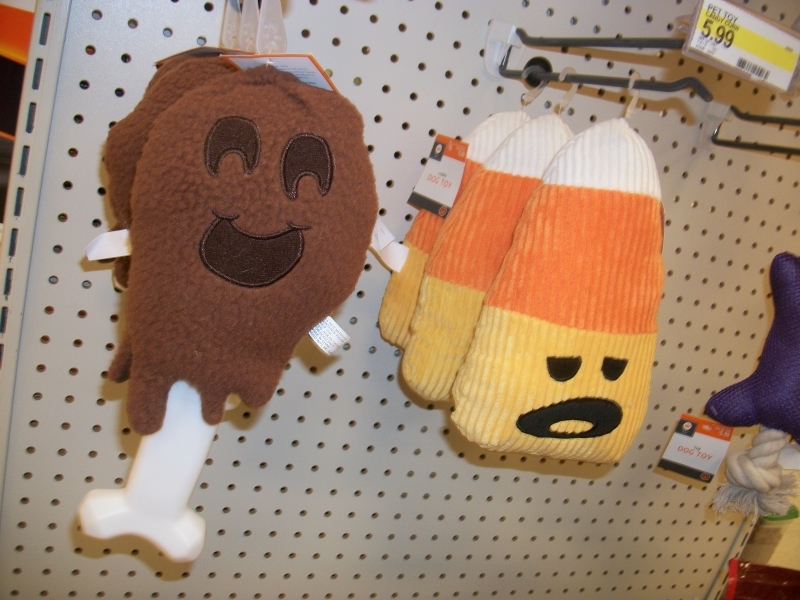 Sharing a rack with plush turkeys, I believe these are "fall harvest" items, otherwise known as "fundie friendly" Halloween products. They can't fool me, though. 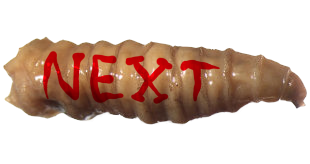 You can't tell me that dripping turkey leg is supposed to be anything other than some kind of meat-ghost. That is a ghost face if there ever was one. Entering the Halloween section proper, these colorful critters were the first thing I noticed, made of soft enough rubber for their arms, wings and eye-stalks to flail as they hop around. Though only two bucks each, only the orange one with the tentacles and the shark teeth felt quite "me" enough, and I still worry that the rubber might be too soft to even hold together forever. It's almost a jelly. Now, you might think these are totally non-specific monsters, but when you've just got some vaguely reptilian beasts with a grab-bag of monstrous features, I'm inclined to think they're specifically monsters of the closet-dwelling, child-scaring variety, and I like to think maybe they're just a highly variable species in their own right. I know that was the subject of a whole Pixar movie, but I always thought it could have been a lot better. Sorry. 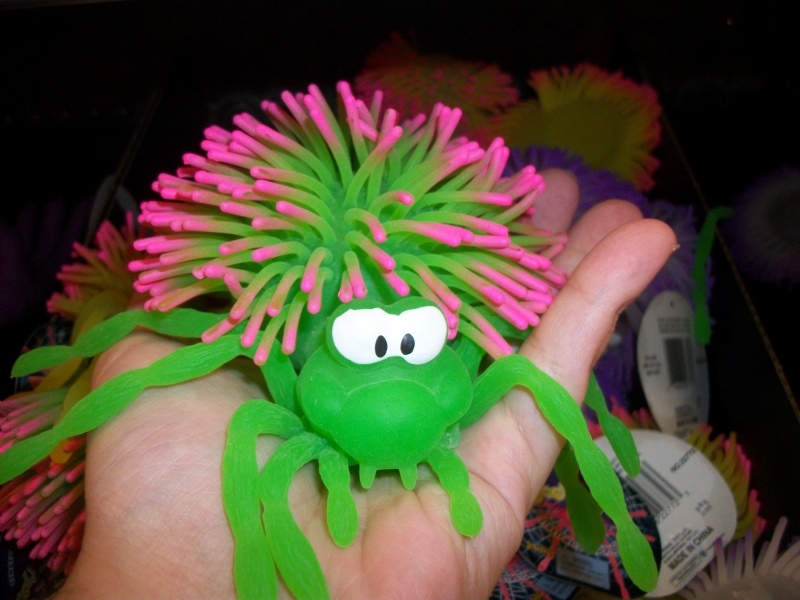 While stretchy rubber spiders have become a common Halloween sight, I've never really seen one with a stylized, cartoonish face like this, or one with "koosh ball" fur. It actually kind of looks like Yoshi, doesn't it? Wouldn't Yoshi have been great as a giant green spider? Nothing else about him would need to be work any different. He could shoot webbing instead of the chameleon tongue thing, and instead of turning shy guys into eggs, he turns them into dessicated, cocooned corpses. 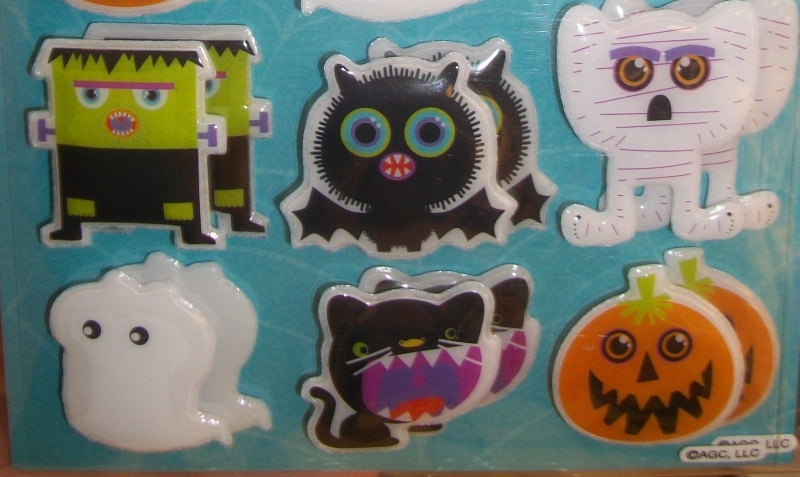 Found up near the greeting card section, these puffy plastic stickers have some lovable designs in general, but it's the bat really stands out, with its circular, leech-like mouth, owl-like eyes and prickly fuzz. I think this might be one of my favorite Halloween bat designs ever, and you get four of them out of one sticker sheet! I bought two sheets, so I have EIGHT opportunities to improve anything I want with a fuzzy bat-owl-leech. 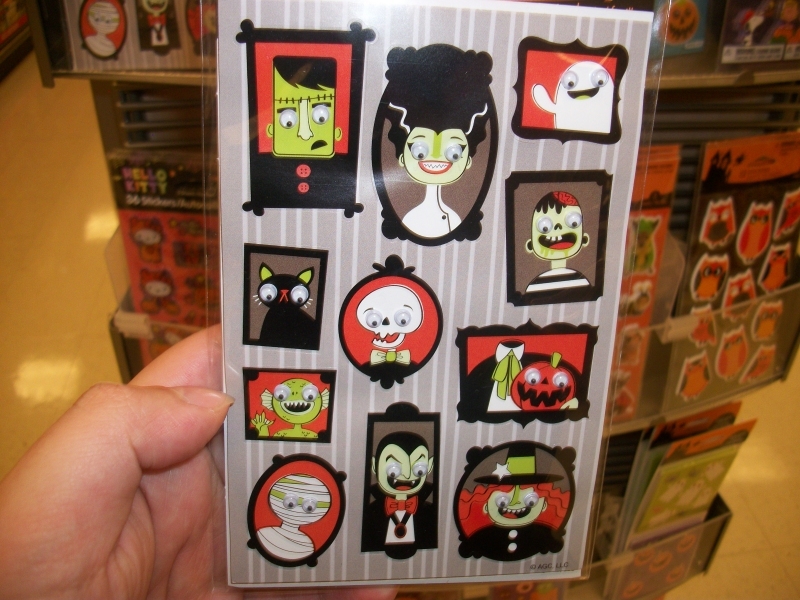 How freaking cute is it that this sticker sheet is set up like a wall of family portraits from a haunted mansion!? I will never remove any of these stickers. The complete sheet is the prize. I like how, with googly eyes, they give you that "haunted cartoon painting" effect, and I also like how the "bride of frankenstein" there is both the most prominent and apparently wearing a lab coat. I can only interpret her as the head of this household, and the scientist who built her own husband to help raise all these unrelated monsters she adopted. 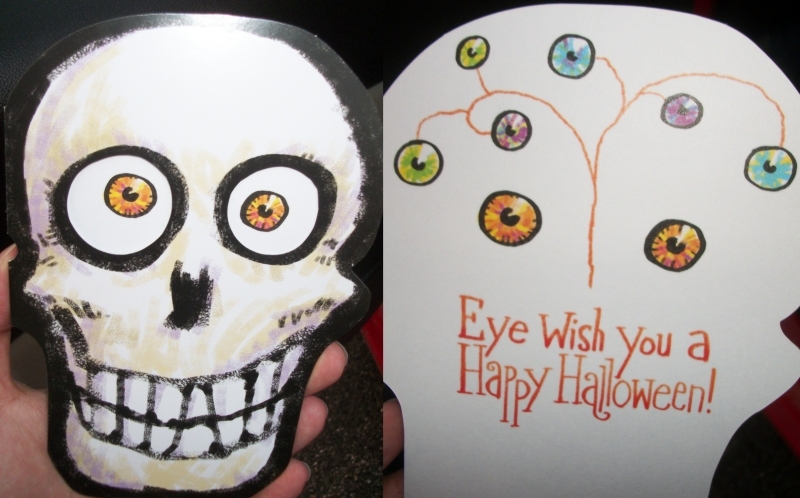 When I noticed that this skull card's eyeballs were printed on the inside, I knew it'd be for a cool gimmick, maybe even a glimpse of its brain. Instead, it went even weirder on us; this skull contains a whole "tree" of eyeballs! That's so awesome, that I'm really glad I thought of it before. 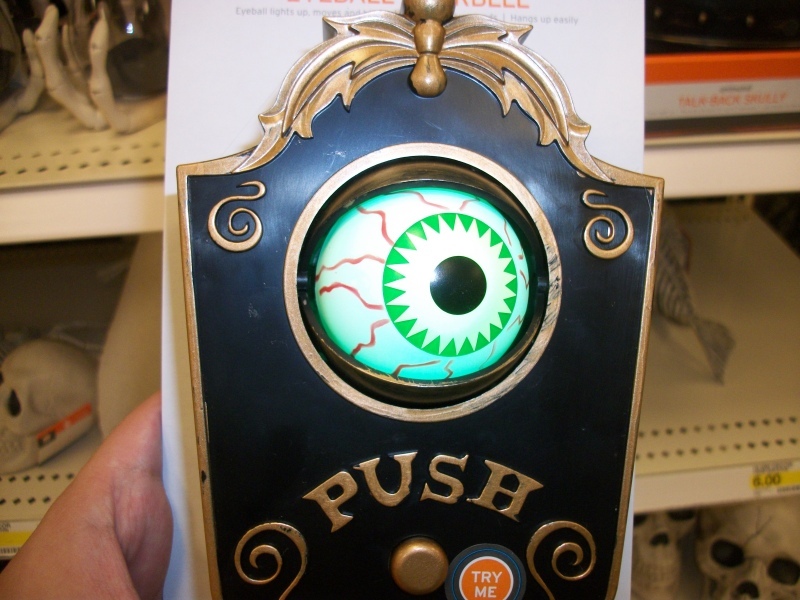 Press the button, and the eyeball in this doorbell opens up and looks back and forth, glowing an eerie green! It's also supposed to make noise, but none of them emitted anything other than a mechanical buzzing. Still cute. Remember that robot eyeball Jabba the Hutt had as basically a bouncer? I loved that thing. I guess this is the organic, magical fantasy version. Another Crazy Bonez product I didn't know about until Target! Together with those skeletal frogs from Michael's, we're halfway to a whole "skeleton bayou" themed party. 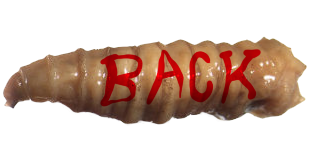 If we had some giant leech and mosquito props we'd be the rest of the way there. 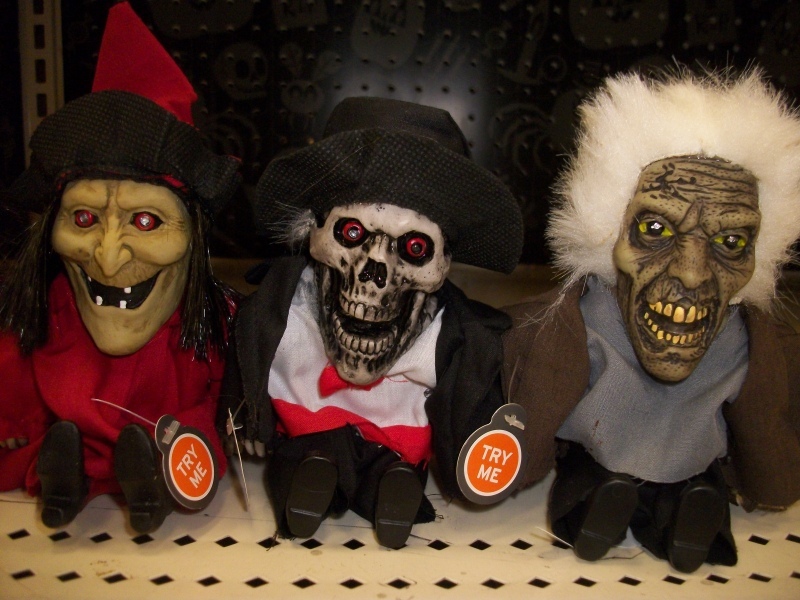 2015 brings about yet another new line of miniature, screaming Halloween figures. Not as cool as the nurses I found last year, but pretty cool, and more elaborate than most other lines, since these have fabric clothes and even poseable arms! Not legs, though. Their legs are perpetually locked in that adorable sitting position, so they can go on just calmly sitting in place, hilariously staring straight forward while they unleash bloodcurdling shrieks for no reason. It also seemed like somebody got curious to see what was under these screaming corpse's clothes, and surprisingly, it really honestly wasn't me. It's funny how they actually bothered to paint the otherwise featureless, slab-like rubber body with the same texturing as the arms and hands. I really appreciate that these guys are designed to still look almost presentable in the buff. What's that? Someone else's little shits think they're entitled to your hard-earned candy, completely free of charge!? Make them earn those cavities by listening to a bone pun every time they reach for another piece, which if you're smart won't actually be a real piece of candy at all, but an empty wrapper that just says "you're welcome" on the inside. You did give them a free bone pun, after all. What I really like about this particular routine is how the two skull's voices accidentally switch at one point. 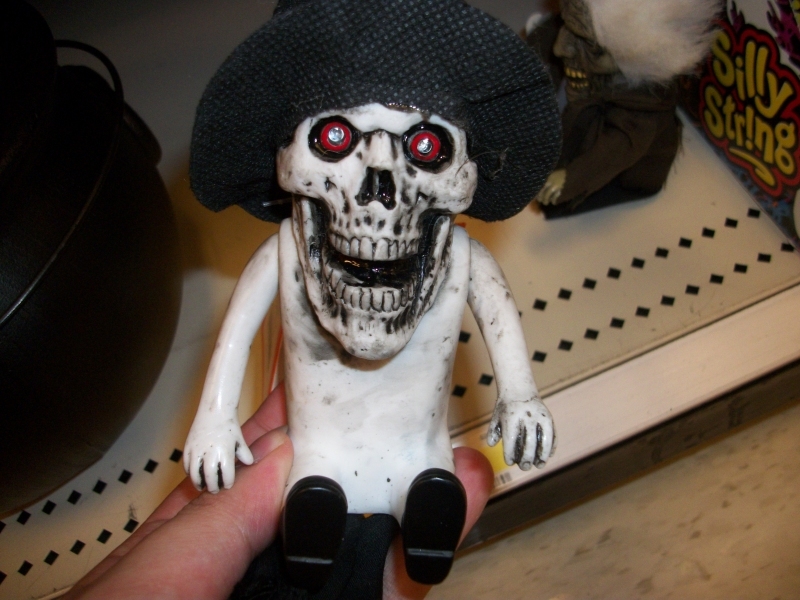 I've always said I wanted to see more nautical Halloween items that weren't just "skeleton pirate" themed. 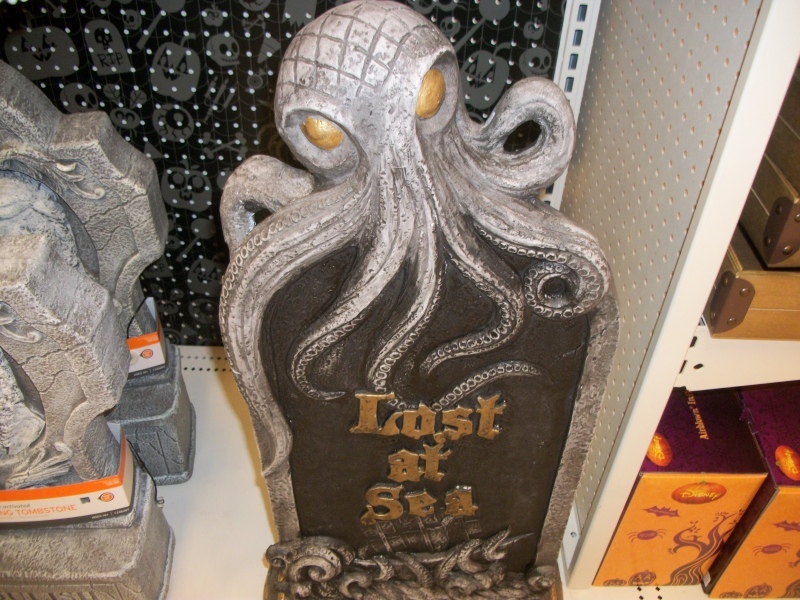 Now you can not only nab skeleton fish at Target this year, but if you're lucky, they'll have one of these big, heavy decorative tombstones left, with what's either a carving of an octopus or an actual stone-like octopus clambering all over it...or maybe it's a mind flayer's head, which it much more closely resembles. This really gets me thinking, though, about more ocean-themed Halloween items. It's a thought I've had before, even years before all those skeleton fish showed up, and it's a thought I promised to expand upon this very season. 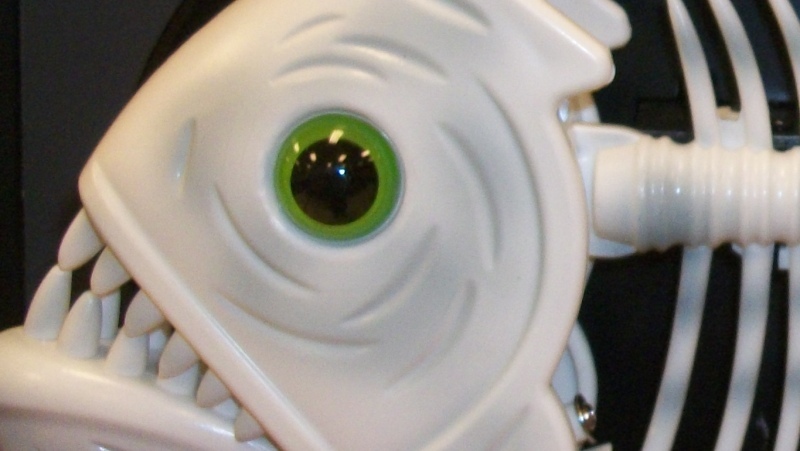 I hope you're ready for a whole article that's basically "Halloween, but Underwater" cause I am PUMPED to do that.